If you are interested in holding an event at the Professional Development Center, please submit our External Request for Space. Once you submit it, you should hear back from us in the near future about availability. Wedding reception requests are welcomed. If you are part of William and Mary and requesting Matoaka Woods, Holly, Dogwood, or the Boardroom, please submit our Internal Request for Space. The 11,000 square foot Professional Development Center (PDC) is an attractive, functional meeting space intended to serve as the School of Education’s main venue for hosting meetings, conferences, and other events in support of the professional development of educators. The PDC can accommodate meetings for 10 to 375 people. Central to this mission, the PDC supports the outreach work of centers, projects, and faculty affiliated with the School of Education by providing a convenient, well-appointed setting for small- and large-group events. 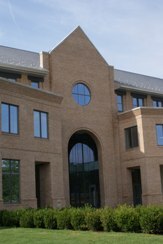 The PDC also serves as a venue for College departments, offices, and programs, as well as for community-based educational, non-profit, and governmental organizations, to conduct meetings and professional development activities in support of their respective purposes, especially as aligned with the SOE’s core mission. Additionally, the PDC is available to private organizations and individuals as a venue for business and social functions. To find out how your group would be classified, view our classification chart. Green Meetings - Our building, built in 2010, is Leadership in Energy and Environmental Design (LEED) Gold certified from the U.S Green Building Council. Location – Looking for an excursion on a free afternoon or over the weekend following your conference? The School of Education is just 1.4 miles from Colonial Williamsburg. We're a short driving distance from Busch Gardens Amusement Park, Water Country U.S.A., Jamestown, and Yorktown Battlefield. For shoppers, the Williamsburg Premium Outlets and Merchants Square make a fun afternoon outing. Golf enthusiasts enjoy spending the morning at a championship off-site course. Catering- The Professional Development Center allows a number of caterers to service its conference groups. We realize that the varied needs of our groups are best served by allowing varied caterers, each with their own flair and style of service. Talk with your event coordinator to learn more about the options. Parking - Guests display a complimentary parking pass in their windshield. Passes can be distributed electronically to participants so they can print and post the pass upon arrival. In most cases, there is adequate parking directly surrounding the School of Education to accommodate guests. Wireless Internet – Guests receive complimentary wireless internet access on their personal laptops for the duration of the conference. Audio-Visual Technology – Rental of the LCD projector, screen and podium microphone are included in the room rental cost. Our goal is to be transparent with pricing so you can avoid hidden costs and your budget stays intact. We installed easy-to-operate equipment where the screen drops and the projector turns on with a touch of the finger. Additional equipment such as lavaliere microphones, document cameras, and DVD recorders are readily available for a nominal usage charge. Hotels – There are several hotels and bed and breakfasts within a mile of the School of Education, so you can make arrangements for a block of sleeping rooms at a wide assortment of establishments. If you are holding a summer event and looking for attendees to experience college life, sleeping rooms in campus residence halls may be available at a reasonable rate.